We started something new with Caden that we did not do with Connor. We started taking his monthly pictures so we could see his growth throughout his first year. At the end of the year I am going to put all the pictures in a book together and use as gifts. Caden will be 11 months old on the 11th, but I've only edited up through his eight month photo. So here it is!!! 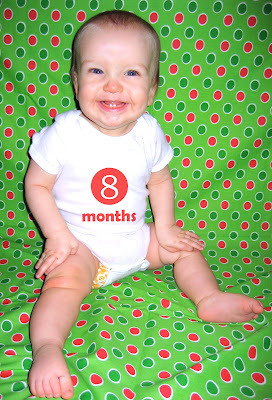 He turned eight months on December 11, 2011. Our Crazy Life Right now!